Workshop on USFDA/USDA Laws and Regulations on June 23rd. 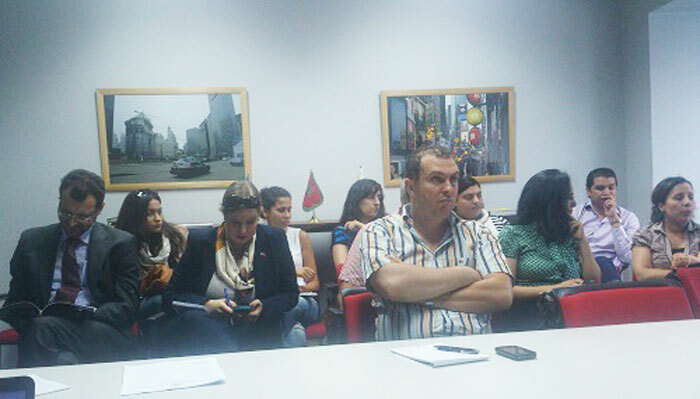 On June 23, AmCham hosted the first workshop for the Export Lab participants on USFDA/USDA Laws and Regulations. The workshop was addressed by Leila Radi, food safety and US Market consultant. Topics included Introduction to the US market, US market regulating agencies such as USFDA, Customs, USDA and recent regulations such as traceability, scanning and labeling. Two main sectors were involved in this workshop including food and beverage and natural cosmetics. Main companies in attendance were Arradé Cosmetics, Amys Group, SLM Pharma, Marogreen, Ahla, Azbane, Orness laboratories, Maroc Clean, Agricold and VMM. • The U.S. market is huge but very lucrative for niche products. • Moroccan exporters should focus on niche market such as ethnic food. • Moroccan exporters need to adapt their product to U.S. consumer needs. • Ethnic groups are growing in the US such as Hispanics. Labels need to be translated into English and Spanish. • The export strategy should be adapted to each case. • Moroccan exporters could use a broker or partnership with a U.S importer/Wholesaler to distribute their products in the U.S.
• Exporters need to use internet tools to market their product including: Blogs, and e-commerce websites. • Labeling is an important aspect for exporting to the U.S. market. Almost all sectors are subject to labeling requirements. • The organic certification is not handled by FDA. USDA is in charge of organic certification, which is done by certifying entities such as Ecocert. • If the ingredients are certified organic and the final product is not, then the exported product could not be marketed as organic. The certification process in this case is smooth and easy. • AmCham suggested creating a club of Exporter to the U.S. to share best practices and mentor other exporters. • AmCham suggested a Made in Morocco event in the U.S. to promote Moroccan. The name Moroccan is used to market non Moroccan origin products. • Export readiness: Is your company ready for export? • Have you thought about using Market research before exporting? • Auditing is an effective tool to prepare companies and their products to the U.S. export market. The Moroccan ministry of commerce and industry subsidizes exporters willing to do an export audit for their companies. • It is important for exporters to develop knowledge about the U.S. market. • Exporters need to be ready administratively including the export number which is delivered by the Moroccan custom administration. • Exporters need to do a good research about Harmonized Tariff Code of their products and need to include it in their client’s invoice. • In 2006, Morocco and the U.S. signed a Free Trade Agreement (FTA), which reduce import duties for Moroccan exporters. • The import duties are not a limiting factor to exporting Moroccan products to the U.S. market. • In addition to the Free Trade Agreement (FTA), Morocco and the U.S. signed a trade facilitation agreement (TFA), which help smooth the clearance process especially for perishable products such as citrus. • Participating in trade show is a good investment for companies willing to prospect the U.S. market. • The November-December period is the best timing to test the U.S. retail market and promotes its products since coinciding with holidays. • Exporters could use high traffic spaces such as malls, supermarkets, and subway stations. • In trade shows, Moroccan exporters could associate with U.S. distributors in order to be able to use U.S. e-commerce platforms. • From Mushmina’s perspective, U.S. consumers are more looking for products associated with history such as Moroccan origin. • Brand identity is an effective marketing asset for exporting to the U.S.
• Exporters may consider in their pricing strategy the return policy as well as free shipping as a strong sales argument. • The sales price may include the shipping cost in order to advertise free shipping arguments. • Available incoterms for exporters includes FOB, and duties paid to. Clients’ preferences are to have products delivered to them, instead of dealing with import constraints. In this regards, the incoterm of duties paid to is more appealing to costumers. • The mark up for handmade accessory is estimated to 2.5 times of the initial export price. Exporters could use online resources and e-commerce to boost their export to the U.S.
• Moroccan exporters could use cross-promotion to combine their offers and boost their sales. Mushmina’s handmade bags could be associated with Moroccan cosmetics to make gift packages. • Exporters could use the Moroccan export insurance company (SMAEX) which subsidizes partially participation in trade shows. • Moroccan exporter could develop a franchise adapted to the U.S. Market. Interested exporters could reach out to the International Franchise Association (IFA). • The Moroccan Ministry of Foreign affairs could endorse the Moroccan brand and hence export by offering products to VIP visitors. VIP visitors are a strong brand representatives and hence an effective asset to promote Moroccan product. • Moroccan exporters should benefit from public programs to endorse their export to the U.S. The American Chamber of Commerce in Morocco is a non-profit, non government organization which represents American and Moroccan businesses and individuals.